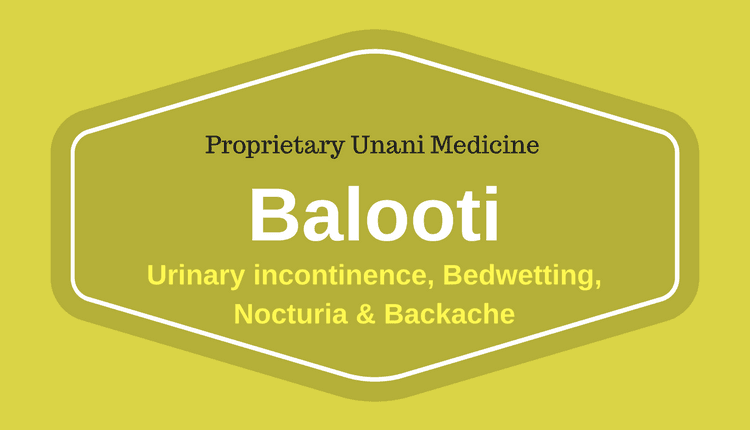 Balooti is a Proprietary Unani Medicine used for kidney and bladder disorders. It is a product of Hamdard Laboratories (India). It is indicated in urinary incontinence (involuntary urination), frequent urination, and enuresis (bed wetting). Furthermore, it is also used in backache for its pain-relieving characteristics. Note: Balooti also contains Sodium Benzoate as a Preservative. Cannabinoids are present in Cannabis Sativa seeds. However, the bioavailability of its oral ingestion is comparatively less when used in the form of smoke. It affects the mind and decreases anxiety, which is commonly linked with enuresis and frequent urination. However, Boswellia Serrata and Pistacia Lentiscus are also known for their mild diuretic action. But Quercus Incana, Boswellia Serrata, and Pistacia Lentiscus also have astringent action. These herbs also strengthen kidneys and urinary bladder. These herbs reduce bladder instability and excitability of nerves and muscles. Through this mechanism, these herbs might prevent involuntary urination and bed-wetting. How many times should I take Balooti? When should I take it? Balooti is recommended once a day at night in conditions of Nocturia (excessive urination at night), and enuresis (bed-wetting). In cases of Urinary incontinence, Pollakiuria (daytime frequent urination) and backache, it can be used twice daily. Warm milk is a preferable adjuvant for Balooti. It can also be taken along with warm water. 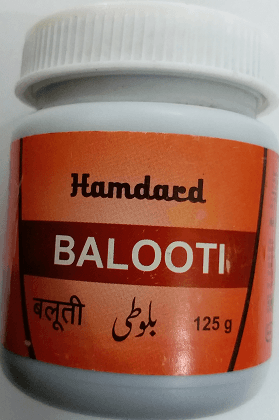 Hamdard Balooti is LIKELY SAFE & WELL TOLERATED in the most people when above points are considered wisely and taken as per its indications in appropriate dosage under professional supervision. There are no side effects reported with Balooti. However, its taste is not liked by children and some may vomit it out. can this medicine be taken for frequent urination and dripping problem related to enlarged prostate ( I have an enlarged prostate 55 gms and presently taking Urimax 0.4 mg and in addition, Prosteez ( Charak) + sabal serrulata 10 drops once a day. would appreciate to receive your reply. It should be helpful if you take it with Chandraprabha Vati. then, is it ok to continue urimax + prosteez + sabal serrulata and now in addition chandraprabha vati + balooti. hope these are not too many !! There should be no problem with these. Sir my mother is 82 yrs she is affected with COPD . It’ becomes difficult to give her water becoz as soon she drinks water she starts heavy coughing and in relation to this a thick mucus starts gathering in her throat and mouth . The mucous is very very soapy, thick and ropy . Due to this it becomes difficult for her to swallow anything even her saliva. It becomes very problematic for us, so we make her lie down on bed facing any side. Due to this her thick , ropy saliva slowly comes out from her mouth and her coughing stops. Sir I request u to please suggest some good medicine so that such thick saliva or mucous never developed. I shall be very grateful. I love my mother very much. She is everything to me. Dear doctor i am having serta 25 trika25 regularly and lonazep md 25 as sos…for anxiety and panic attacks…I want to stop my dependancy on these medications…how many tablets of Divya medha vati extra power do I need to take per day. ?